Monarch Air Group provides private air charter in Denton, TX. Our clients benefit from top-notch service, unrelenting dedication to safety, wide selection of aircraft, and years of experience in chartering private jets. To obtain a free quote, please use our online quoting tool provided below, or call toll free 1-877-281-3051. Monarch Air Group provides private jet charter flights in and out of Denton, Texas, USA. Denton is a commercial city in northeastern Texas. 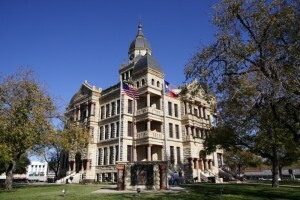 With a population of about 113,383 people, Denton is the 27th most populous city in Texas. Denton is renowned for its active music life, the Denton Arts and Jazz Festival, and the North Texas State Fair and Rodeo. With more than 45,000 students enrolled at 2 universities situated within its city limits, very often Denton is characterized as a college town. The most popular tourist attractions are Little Chapel in the Woods, Courthouse-on-the-Square Museum, Campus Theatre, Bayless-Selby House Museum, and many others. The nearest airports are Dallas/Fort Worth International Airport (DFW / KDFW), which is located 26 miles from Denton, and Dallas Love Field (DAL / KDAL), which is located 37 miles from Denton. 3. AHD, Downtown, Ardmore, United States. 13. MWL, Mineral Wells Arpt, Mineral Wells, United States. 14. PNX, Grayson County, Sherman-Denison, United States. 15. RBD, Redbird, Dallas, United States. 1. Holiday Inn Hotel & Suites Denton University Area, 1434 Centre Place Drive, Denton. 2. Holiday Inn Express & Suites Denton-UNT-TWU, 4485 North I-35, Denton. 3. Holiday Inn Hotel & Suites Denton University Area, 1434 Centre Place Drive, Denton. 4. Holiday Inn Express & Suites Denton-UNT-TWU, 4485 North I-35, Denton. 5. Days Inn Denton, 4211 N Interstate 35, Denton. 6. Holiday Inn Hotel & Suites Denton University Area, 1434 Centre Place Drive, Denton. 7. Holiday Inn Express & Suites Denton-UNT-TWU, 4485 North I-35, Denton. 8. Days Inn Denton, 4211 N Interstate 35, Denton.